You are currently browsing the MSBLOG weblog archives for September, 2011. Phew! We’re all back from BUILD and focused on our next milestone. It is fair to say we had an awesome time showing everyone Windows 8 in depth and all of our speakers and Microsoft attendees are unbelievably appreciative for the warm reception you gave the product. We know it is early still–a developer preview–and there are lots of questions. We’re going to be answering them in new posts as we focus on using the Windows Developer Preview (WDP) as a baseline–so if you haven’t been running it, consider it sort of like a prerequisite for many of the blog posts. Boot is the sort of effort that gets no respect. It is either too long or all the work to make it nice and pleasant hopefully goes unnoticed since you never want to boot your machine. I remember a meeting many years ago where Bill Gates said (paraphrasing) “Boot is a one-line function call that computes a constant yet takes forever: fBoot = SystemBoot()” At the same time it seems like everything boots these daysâ€”phones, TVs, cable TV boxes, even my TV remote boots. In building Windows 8, we set out of take advantage of some new technology and revisited some old assumptions to totally rethink the boot experience. We also wanted to make it more accessible and better suited to devices without keyboards. Of course, we also did a lot of work to continue to minimize reboots altogether, but this post is about what happens when you do boot. Billie Sue Chafins authored this post. She is a long time program manager who spent many years on user interface design, and in this release she helped us to focus on the boot experience (in addition to the Metro style app sharing contract which you can learn about from BUILD here). Posted in MS News | Comments Off on Bing with video background? If you are wondering where can you download the Windows Server 8 Developer Preview, it is only available for MSDN Subscribers for now. Many are reporting the downloads to be very slow, however, if you have a MSDN subscription that method is reportedly faster right now. 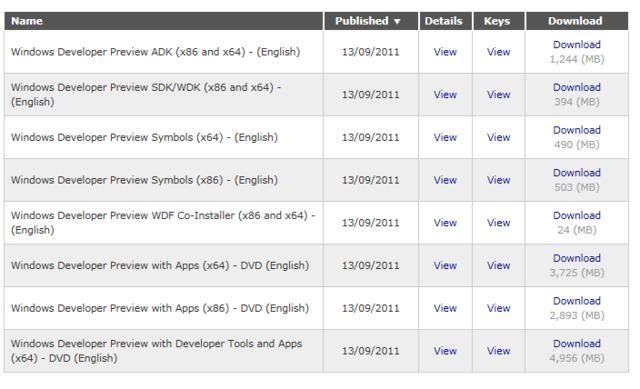 Interestingly, Windows 8 dev preview expires on 3/11/2012 4:59PM. Does this mean we’ll see a beta sooner than we thought? What are you waiting for? Start the download and give Windows 8 Developer Preview a test drive! What? Windows 8 includes Hyper-V? Today in the Windows 8 Blog, Microsoft talked about the integration of Hyper-V embedded into Windows 8. The company plans to offer Hyper-V with Windows 8 when it launches, allowing consumers to create virtual machines on their desktops or laptops without the need for third-party software, like VMware. Hyper-V will likely be available only in the Professional or Ultimate edition of Windows 8, although edition information has not been released, and will require the machines they run on to have a 64-bit version of Windows 8. In order for machines to support and run Hyper-V correctly, the minimum requirement for RAM will be 4GB, but more will definitely be needed for better performance. Hyper-V will be able to support both 32-bit and 64-bit versions of operating systems. Microsoft does state in their blog that users will be able to run 3 or 4 VMs with 4GB of RAM, but will require more RAM if users wish to run more VMs on the same machine. The VM Console will be able to support a single monitor view with 1600×1200 resolution in 32-bit color. Windows 8 will also launch with native ISO and VHD support, allowing users to create virtual machines directly from an ISO file. Windows 8’s feature list is really starting to come together and we can expect some further exciting announcements next week at the Microsoft BUILD conference in California. Neowin will be live from the event between September 13-16. Microsoft included a video demonstration of Hyper-V support on their blog, which can be found here. Posted in Microsoft, Products | Comments Off on What? Windows 8 includes Hyper-V? a full-loaded version with a 128GB SSDÂ for $1349. the web in landscape mode. when you can get to work.